Mercy Ministries News: Another Graduation Celebration!! This week, four girls graduated from the Nashville program. Here are their incredible stories of freedom and transformation. I was raised in a Christian home by two wonderful parents, who were also pastors. I started to question my faith when members of our church hurt me and my family. These people claimed to be Christians, yet they lived ungodly lifestyles. I was sexually abused by someone in the church, and soon, Christianity had become nothing more than religious words and empty rituals to me. I chose to walk away from the Lord. I began to struggle with an eating disorder, self harm, emotionally abusive relationships, depression, and drug and alcohol abuse. Then I faced another devastating blow. I had a miscarriage. I was deeply saddened and angry. I was in desperate need of a God who would relate to me personally and pursue me. 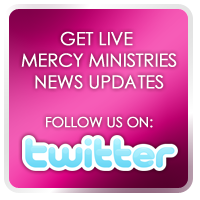 I learned about Mercy Ministries through a friend who had gone to Mercy about 8 years ago. I decided to seek help and apply to the program. When I arrived at Mercy, I struggled with issues from my past and my relationship with my family. I desired a lifestyle of passion and purity that stems from a real relationship with the Father God. Over the past 6 months, I have developed a personal relationship with God. He has swept me off my feet and shown me what true Christianity is. The Lord has healed the wound left behind when I lost my daughter. He has answered every question in my heart and given me back the joy of being a mother – even if my child is not present with me. This gift is priceless and proves that all things are possible with God. After graduation, I am moving to Murfreesboro, TN. God has revealed His plans for my life. I will attend Kingdom Living Ministries Church and work with their youth group. I plan to attend MTSU and pursue a degree in Sociology with a minor in Psychology. Eventually, I want to work towards a Master’s degree in Counseling. God has called me to the ministry, and I can’t wait to be able to help others find their freedom in Christ. My main goal in life is to become a wife, mother, worship leader, and women’s pastor. If other girls are considering Mercy, I want them to know that it is not an easy solution to their problems. But it is a true solution to any problem – and any real solution to a problem is never easy. If you are looking for something to ease your pain, look elsewhere; but if you are looking for a place to show you how to overcome your pain, you have arrived. True freedom is priceless. I have searched high and low, at the bottom of every kind of bottle, and in all the wrong places. Mercy has been the only place that has been able to point me clearly to the only One who not only offers, but who authored true freedom. Growing up, I struggled with a ton of false responsibility. My father was absent from my life and I tried to fill that void by taking on a parental role. I put pressure on myself to live up to my own unrealistic expectations. When I was 10 years old, I became depressed and I turned to anorexia. That led to a deeper depression, suicidal thoughts, and self-harm. At age 11, I checked into my first treatment center. I continued to go in and out of different facilities for years. Nothing seemed to work and I lost all hope for my future. Before finding out about Mercy, I reached rock bottom and started abusing drugs. Luckily my counselor told me about Mercy Ministries. I knew Mercy was my last hope for freedom. Since I have been at Mercy, God has set me free from my eating disorder and drug addiction. I have a whole new perspective on life and have no desire to harm myself. I have learned how to trust God and how to love myself for who He has created me to be. God has completely transformed me from the inside out. Now I believe in myself and look forward to a bright future. After Mercy, I plan to go home and spend my summer with my family and baby brother. I am looking forward to living life as a normal teenage girl. I am going to go back to high school in the fall. After high school, I plan on attending a university. I want others to know that Mercy has transformed my life and can help any girl struggling with life-controlling issues. At Mercy, I learned to keep fighting problems when they arise and never surrender. Ultimately, my past is just a part of my testimony and now there is so much good to come out of my life. Thank you so much Mercy! I grew up in a Christian household, but I was afraid of God. My religion was based on fear, and I didn’t know that it was even possible to have a personal relationship with God. I have always been very independent and have tried to set my own rules. As a result, I started smoking marijuana, which led to other drugs. Soon my life became consumed with my addiction. I moved out of my house and looked for a way to support my habit. I became a stripper and continued to abuse drugs. I stopped paying my rent, stopped taking care of my dog, and stopped caring for myself. I found myself in an abusive relationship and became depressed. Then I found out I was pregnant. I knew I had to change my lifestyle. If things stayed the same, I would end up dead or loose my unborn baby. I heard about Mercy Ministries through a former graduate, Emily. While at Mercy, I have come to realize God’s unwavering love for me despite my actions. For the first time in years, I could breathe again. God has revealed His grace to me and has forgiven my sins. He has restored my life and filled it with joy and laughter. After Mercy I plan on devoting my life to my son, Judah. I am so excited to be a mom. Mercy saved my little boy. I also plan to attend college this fall to pursue my dream and become a public speaker. Congratulations girls – we are so proud of you! !